Viper’s Tom Matsiko(left), Nelson Ssenkatuka(right) of Bright Stars and Bernerd Muwanga of SC Villa (background) during a training session at Naboole yesterday. Photo by Shaban Lubega. 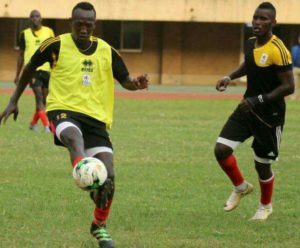 FOOTBALL–The Uganda Cranes have this morning departed for Lira ahead of the match against Northern Region select team. This comes after completing only one training session on Thursday evening in which 23 players where in attendance under the watchful eye of Coach Moses Basena, his assistant Mathias Lule and goalkeeping coach Fred Kajoba. “I am happy for the regional tour project because it gives a clear picture of players who are ready for the senior team,” Basena said. “It is a different game compared to that of next month but we always use it to get the much needed competitive playing time and also see how fit some players are,” Basena added. The regional tour game is one of the build-up games ahead of the crucial World Cup qualifier match against Ghana next month. Uganda is second in Group E, with just two points behind Egypt and a loss to the black stars will mean we have zero chance of qualification to Russia 2018. Ismail Watenga -Vipers SC, Benjamin Ochan-KCCA FC, Tom Ikara-Kirinya Jinja SS. Nico Wadada-Vipers SC, Dan Bilikwalira-Vipers SC , Joshua Awori-Proline FC, Savio Kabugo-Proline FC , Timothy Awanyi-KCCA FC , Bernard Muwanga-SC Villa, Fred Okot-URA FC, Isaac Muleme-KCCA FC. Tadeo Lwanga-Vipers SC, Ibrahim Kayiwa-KJSS FC, Tom Masiko-Vipers SC , Paul Mucureezi-KCCA FC, Moses Waiswa-Vipers SC, Kalyowa Emma-Soana FC, Shafic Kagimu-URA FC, Muzamir Mutyaba-KCCA FC. Derrick Nsibambi-KCCA FC, Nelson Senkatuka-Bright Stars FC & Albert Mugisa-Police FC, Milton Karisa-Vipers SC.